Featuring Larry Cohen, J.J. Abrams, Rick Baker, Eric Bogosian, Barbara Carrera, Cynthia Costas-Cohen, Joe Dante, F.X. Feeney, Robert Forster, Megan Gallagher, Mick Garris, Yaphet Kotto, Paul Kurta, John Landis, Laurene Landon, Traci Lords, Michael Moriarty, Tara Reid, Eric Roberts, Martin Scorsese, Janelle Webb and Fred Williamson. Distributed by October Coast. 107 minutes. Not Rated. From when I was a kid, I have a strong memory of a TV ad for a cheesy horror movie. It was a very simple ad. In a black background, the camera is pointed at a wicker cradle. As the camera slowly swirls around the cradle, with a tinkling lullaby playing softly in the background, an announcer says: “The Davises have had a baby. But they are not sending out any announcements. Most new parents are a little scared when they have a baby. The Davises are terrified. You see, there is only one thing wrong with the Davis baby. It’s alive.” As this narration ends, the camera pans in on the cradle, focusing on a single red arm dangling over the side, complete with two sharp claws. I don’t know if the movie was good. I rather imagine it was probably pretty bad. That doesn’t matter, though, I remember It’s Alive better than many of the much bigger films which came out in 1976. 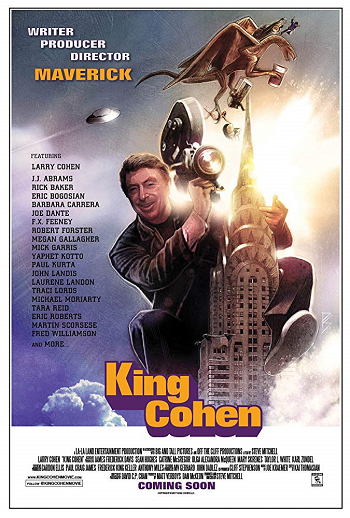 King Cohen is a good-natured documentary celebration of the bargain-basement filmmaker behind that and many other b-movies – including Black Caesar, Q: The Winged Serpent, Hell Up in Harlem, Maniac Cop, The Stuff, Return to Salem’s Lot, Phone Booth, Best Seller and many, many more. “All the movies I do take something that is considered benevolent and turn it into some kind of monstrosity,” Cohen explains in King Cohen. And it is true – he has created killer babies, killer cops, killer ambulances, killer yogurt… He made movies about religious violence and race relations long before those subjects were deemed suitable, though they were reflected in Cohen’s own idiosyncratic and slightly warped worldview. King Cohen is just a stroll down his back-history, a loving chronicle of his greatest and his wildest moments, attested to by a group of friends, co-workers, fans and the man himself. Cohen is a good storyteller and pleasant company, sort of like a beloved-but-slightly-weird uncle with a whole bunch of crazy yarns. For most of his career, Cohen was the king of guerrilla filmmaking – setting up shoots on the fly without permits, or union help, or even alerting the passers-by that a movie was being filmed. He’d drive cars on New York City streets, stage gunfights on the Chrysler Building or in the middle of a police parade, and then use the footage of the horrified and confused pedestrians in his film – a whole city’s worth of panicked unpaid (and uninformed) extras. After putting in several years of varying success in 60s television, Cohen realized in order to protect his creative vision, he would have to take on all the reins of his films – writing, directing and producing. His first real success was with Black Caesar (considered the first Blaxploitation film) and its sequel Hell Up in Harlem. “I don’t know what Blaxploitation means,” Cohen insists in the documentary. “Every movie is exploitation. So, what?” More of these exploitation movies quickly followed, including It’s Alive (which became a relatively big hit two years after its original release) and its two sequels, and other oddball films like God Told Me To and the nearly-serious The Private Files of J. Edgar Hoover. Occasionally the talking heads are a little too fawning – Cohen is a very talented hack but calling him a pioneering artistic filmmaker may be pushing it – but it does show how much fun it must have been to be part of a Cohen location shoot. Also, it does show the love that this offbeat little man with an odd imagination and an incredible work ethic has inspired in the film community. Cohen says in the movie that it would be impossible to get away with most of the stuff he did in the modern world, and he is undoubtedly right. And you know what? That’s a real shame. King Cohen is a fun window back into the days when independent filmmaking was like the wild west. Copyright ©2018 PopEntertainment.com. All rights reserved. Posted: October 7, 2018. Tags: Barbara Carrera, best-seller, Black Caesar, Blaxploitation, Cynthia Costas-Cohen, eric bogosian, Eric Roberts, F.X. Feeney, Fred Williamson, God Told Me To, Hell Up in Harlem, It's Alive, J.J. Abrams, Janelle Webb, Jay S. Jacobs, Joe Dante, John Landis, King Cohen, Larry Cohen, Laurene Landon, Maniac Cop, martin scorsese, Megan Gallagher, Michael Moriarty, Mick Garris, movie review, Paul Kurta, Phone Booth, PopEntertainment.com, Q: The Winged Serpent, Return to Salem’s Lot, Rick Baker, Robert Forster, Steve Mitchell, tara reid, The Private Files of J. Edgar Hoover, The Stuff, Traci Lords, Yaphet Kotto. Bookmark the permalink.